The two Xiucoatl (Xiu = Fire; Coatl = serpent). Outlining the Aztec calendar we find two serpents of fire. These represent duality, good and evil. One of the serpents, Xiucoatl, is the sacred fire venerated by the parsis, the Greeks, the Mayans, and all the cultures of the world. Such sacred fire is known in the West as the Sacred Fire of the Kundalini. This sacred fire is located within each Human Being and each one of us has the potential to awaken and develop it by perfecting the values of our heart and transmuting our creative energies. Those who successfully develop their FOHAT or sacred fire, have the possibility of re-integrating with their BEING, of recovering their lost faculties and transform themselves into a complete and integrated Human Being. Different cultures adored the Sacred Fire of the Kundalini, and they very well referred to it under different names, however it remains as the one thing individual and internal, that each one of us should look-for deep within. The second serpent is the Kundabuffer, the tempting serpent of Eden, Satan’s tail; the negative, luciferic fire we as humans have developed with the manifestation of our animal passions. From this negative fire have come to life the thousands of defects that linger in our psyche and that are at cause for the many sufferings, problems and tragedies that come to be during our daily lives. This negative fire is fatal; it keeps us on a deep state of hypnosis that does not allow us to see that which is real, that leads us to see all things in nothing but limited ways and it also keeps us submerged in the most absolute spiritual ignorance. These are the two serpents, two fires, one positive and transcendental; the other negative and fatal. One is the serpent of bronze that healed the Israelites in the desert, the other is the tempting serpent of Eden. 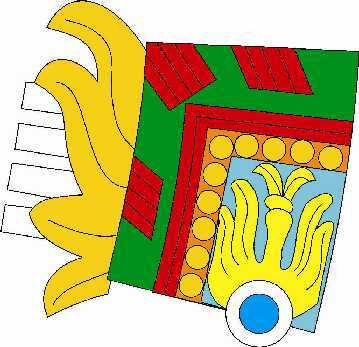 The serpent of fire (Xiucoatl) is the Nahual, or the esoteric garment of the Aztec’s Old God of Fire, Huehueteotl. “The serpentine binary of pre-Columbian Mexico certainly moves us to reflection. 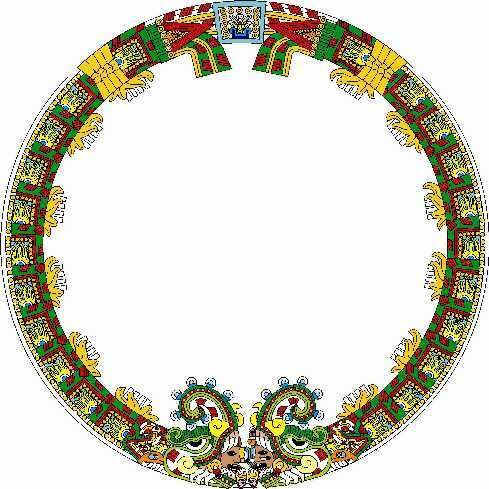 The two fiery serpents or xiucoatls, which beautifully surround the sun in the Aztec calendar, encircled the Major Templeo f the Great Tenochtitlan as well, and made up the famous COATEPANTLI or ‘serpents’ wall’. “The Aztec serpent constantly appears in unusual circumstances that totally deform its organiz aspect. The tail, depicted by a second head in strange poses, leads – by simple logical deduction – to the serpentine binary. “The double head, which clearly suggest the shape of a serpent in a circle – as in the Gnostic representation in which it devours its own tail – appears as in the sacred walls of Quetzalcoatl’s temple (Xhochicalco ruins). “let us emphasize in this treatise the double esoteric character of the Serpent. “We myst make a distinction between the tempting serpent of Eden and the Serpent of Bonze that healed the Israelites in the desert, between the horrifying Python that crawled in the mud of the earth and was wounded in anger by Apollo’s darts, and the other one that ascended up Aeschalapius’ staff (the God of Medicine). “When the igneous serpent of our magical powers ascends along the spinal column of our physical organism, it is our Devine Mother Kundalini. “When the igneous serpent rushes downwards from the coccygeal bone to the atomic infernos of man, it is the abominable Kundabuffer organ. “The venerable Master G. makes the grave mistake of assigning the hypnotic, horrible powers of the descending serpent (the abominable Kundabuffer organ) to the rising serpent (the Kundalini). “Kundalini is a two-term word: Kunda reminds us of the abominable Kundabuffer organ, lini is an Atlantean term which means “end”. “The Kundalini’s victorious ascent along the spinal column provides the end of the abominable Kundabuffer organ. “Undoubtedly, Maurice Nicoll and Ouspensky, the great initiate, accepted this error from Master G. The cited Master considered that the sacred prana was his cosmic mother. If Master G. had studied the serpentine binary in the sacred walls of the Mexican, Toltec, and Mayan temples, he would have never fallen into this confusion. At their very bottom, we find two divinities emerging from the jaws of both serpents of fire. To the left is the God of Turquoise represented as the God of the Night. The rings on its nose and ears are the appropriate adornments of this deity; its face is partially covered with a veil, signifying the darkness of the night. It also shows its tongue as an obsidian knife, in representation of an attitude of constant battle with Tonatiuh, the Sun, whom he fights for the duration of the night. The Sun, represented with the same ornaments that appear at the very center of the calendar, releases a smoke that is directed upwards; this is in representation of the great anxiety caused by the constant battle with the God of the Night. Both gods appear with the mystical Xiucoatl (celestial serpents) with which they acquire a greater authority and superior strength. At the very heads of these serpentine gods is a representation of the Seven “Cabrillas”, or the seven suns of the Pleiades. It is interesting to see that not only the Aztecs paid attention to this group of stars, but also the Greeks and other cultures also saw on this constellation something definitely extraordinary. Universal Gnosticism affirms, that our Sun, esoterically known as ORS, is part of the Pleiades system; the seventh of its suns orbiting around the Pleiades’ central Sun, the Sun of Alcyone. In relation to the Seven “Cabrillas”, an extraordinary ceremony used to be celebrated every 52 days; it was the ritual of the New Fire. “There are many marvelous magnetic centers where many devotional cults were celebrated, such as the ones in Yucatan. But the most important one was the ritual of the Renovation of the Fire, celebrated every 52 years. That is a very special cult. There is a CICLE OF FIRE happening every 52 years. “Was the fire lit here at the center every 52 years? “Well, it was renewed; it was accompanied by the full Liturgy, extraordinary liturgy that has been lost. “Was it a change, something new for all of us? “NEW FIRE, but we have lost all the LITURGY OF THE FIRE. They used to make use of shells, black, red, yellow and white shells, to create smoke; they used to grind them on the fire and create smoke from them for certain religious celebrations where devotional cults were offered to Venus. “What relationship is there Master, between the ones knows as the SEVEN CABRILLAS or PLEIADES with the sun? Precisely on that date where the 52 year cycle is complete, they should pass perpendicular to that hill; and when they did, they believed that for sure the SUN WOULD RISE because it has been foretold that after 52 years, the FIFTH SUN would end. Regarding those 52 years, is a greater cycle beginning? We know the yearly cycle of 52 days is made of a set of sevens isn’t it true? 7 x 52 = 364, so it should make an even greater septenary. “Of course! Just like within our cosmos another cosmos exists, and within that cosmos yet another one exists, in the same way within the 7 cycles of 52 years exist other 7 greater cycles that encompass all of humanity. For example, at this time we are within a much larger cycle, we find ourselves exactly living the FIFTH SUN. “Around these times we await for the great catastrophe. Such an event will be the Mayan KATUN-13. The KATUN-13 will arrive at the year 2043. “Is the KATUN a cycle as well? Some say it is a 20-year cycle, but I don’t believe so, but rather a cycle of 52 years. “No, there are lesser cycles and within the lesser ones, long cycles exist; and within the great cycles, even greater ones exist. For example, the KATUN-13 is very significant. In the year 2043 we will enter the KATUN-13, and entering the KATUN-13 the great catastrophe will arrive… in the KATUN-13 of the Mayans. “The Nahualts assure the SONS OF THE FIFTH SUN will perish by fire and earthquakes; but there are SEVEN CYCLES (lesser cycles of 52 years), but within those 7 cycles of 52 years stands the FIFTH SUN which happens to be such a large cycle. For example, the FIFTH SUN belongs to the Arian Race; the FOURTH SUN to the Atlantean Race; the THIRD SUN to the Lemurian Race; the SECOND SUN to the Hyperboreans; the FIRST SUN to the Polar Race, the Protoplasmic Race. We are currently in the FIFTH SUN; around these times we await for the great catastrophe by fire and earthquakes. “Now, in relation to the Pleiades, we do have people who come from such stars. The Pleiades are deeply related to the archipielago of the Atlanteans; the seven Pleiades correspond to the seven primary islands of Atlantis. It so happens the Nahualts are direct descendants from the Atlanteans, so back then they talked about the Pleiades. This is knowledge that was inherited through the Toltecs, inherited from Atlantis. “The Pleiades are extremely important, they are related with the SEVEN SACRED ISLES and with the SEVEN RACES of humanity. They travel throughout the center of the “Hill of the Star”, because they did very exact mathematical calculations. They did not used to talk about meridians as we do, they simply stated “they passed by” and that was it. Yet they could deduct from that, the coming of wars, destruction, etc. The symbol of Tlachinolli (the sign of the flame) in each of both segments of the two Xiucoatles (celestial serpents) is repeated twenty two times. These represent the twenty two major arcane of the Tarot where the millenary wisdom that has forever driven the student is synthesized. Each serpent carries exactly eleven Tlachinollis (signs of the flame), and 11 is precisely, according to the Kabala, the sacred fire and the Persuasion. 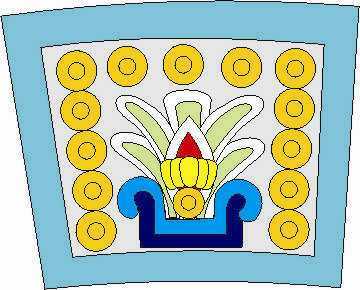 The date of 13-Acatl (or cane) is found at the very top of the Stone of the Sun. This date-symbol is for us a reminder of the thirteen heavens of Anahuac, which correlate to the thirteen Sephirots of the Kabala; the ten spheres of the Tree of Life and the three aspects of the Absolute. These thirteen heavens are regions of both nature and the cosmos that we must conquer, step by step, as we work on our internal purification. The primitive Gnostics referred to this process of internal work the Thirteen Repentances of Pistis Sophia (the Human Soul) in its travel through the thirteen aeons. Of course, these thirteen aeons are the very same thirteen heavens of Anahuac in the Stone of the Sun. The Thirteen also emphasizes the importance of the psychological death in every possible spiritual development. This is also represented by the cane, as the cane is a symbol of the internal esoteric grades that are achieved by all those who choose to walk the path of perfection.